Impact's pest elimination services give full consideration to the responsible use of products. Control measures such as inspection, identification of pest harborage sites and monitoring of pest populations make it possible for Impact to apply materials only when and where they are necessary. 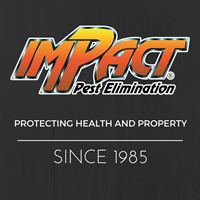 Impact chooses products designed to affect only the target pests to be eliminated. Even in the case of severe infestations, products are never utilized in a manner that would have an adverse affect on humans, pets, or the environment. Fair price for consistently great service. I would highly recommend Impact Pest Elimination for your pest control needs. Impact is great! With the summer months ahead, we know that we can count on their team to keep us pest free! Always professional and always very thorough. Have used them for 6 years. Perfect service. Very quick response and explained billing and methodology. Solved rodent problem. Highly recommend. Friendly staff who go out of their way to be accommodating. Online invoicing and online banking and you are good to go. No issues after 7 years. Have been using Impact for the past 10 years...it is the company that Neal Communities uses and as we are a Neal Community, we chose to go with them for our new home🤗! They have been/are very reliable and aim to please. Any time there is an additional insect issue (over & above our 3-month treatment) , they will send a tech to address that issue. Techs are always friendly and do a great job... also, always enjoyed meeting the owner, Gary when he came by for our ‘yearly’ Termite’ inspection.... nice guy too! Now, we enjoy that inspection provided by Stephanie who also educates us a bit on ‘critters’😍. Impact also keeps price very reasonable... family owned business! Impact Pest Elimination(IPE), Thank you always for doing such a terrific job!!!! We definitely refer IPE to everyone who needs your service. We have had your service for @ 10 years and are very pleased. The service technicians are prompt courteous and up on their pest control. We were pleased with the answer to any question that we asked.. Keep up the great work!! This is a very professional group of individuals. I highly recommend Impact. Good response to any requests, courteous technicians who call ahead and show up when they say they will. I've been very pleased with the service we've gotten from Impact. I have used Impact for over 15 years. The service is very efficient and Terri is truly a great guy with extensive knowledge. I love the fact that the product used is plant based and safe for the environment and my dog. Elvin has been our technician for many years. He is dependable, knowledgeable and very respectable. We are quite please with the service that he continues to provide us. Wonderful service, polite and professional staff! Thank you for the quick response and professional service! Mike was very professional and courteous. He inspected the condo we are buying for termites and explained the findings and recommendations clearly. The person who did the inspection was on time, well spoken and very effective. I would trust them with all future jobs. Kathy Mason. We’ve been using impact for the past 6-7 yrs or so and couldn’t be happier! We will keep their services, always! We are very pleased with John. He is thorough and friendly. Things are much better at our house since he has our route. Punctual, efficient and thorough. Provided concise feedback on how to address a pest control issue. Would use in the future and would recommend to others. I been using Impact for 10 months now, and no problems at all. Best company we have ever dealt with in terms of total pest control. Have owned many properties in Florida and Impact has an exceptional staff that always takes care of our needs in a prompt and efficient manner. I have recommended Impact to family and friends over the years. Impact Pest staff are friendly and reliable and they accommodate appointments around my schedule. We are very pleased with Impact Pest. The technician does a very thorough job. Friendly and Polite. No sign of pests! Impact Pest Elimination was prompt and professional! We were able to schedule an appointment quickly, and the company completed the work with thoroughness and efficiency. The price was right, too! We highly recommend them! I had an inspection done by ELVIN, an inspector with the S. Tampa office. He did a VERY thorough inspection and was very wonderful to work with. Love the service and professionalism!!! Couldn’t be any happier with Impact!!! The Impact team is very responsive to our pest control needs. Everyone is very professional and courteous. Great inspection with tons of knowledge and very thorough. The service is great the people are very nice Highly Recommend. Dave is the BEST! He is very thorough with everything he does as well as personally addressing any issues or concerns you might have. Great service. Would highly recommend 👍. We have been Impact customers for 12 years and we have been completely happy with their service - both routine fumigation and emergency needs. The techs are always on time and thorough and the administrative portion of the business is run very smoothly and conveniently. Fair and honest service is not always easy to find, but we found it with Impact. Company always shows up on time and technicians get to know your home and it’s issues. We've been using Impact for more than 15 years and have always been completely satisfied with their services. I highly recommend them for pest control, termite services and dryer vent cleaning. Their employees are knowledgeable, on time and efficient! Very responsive. Employees are polite, respectful, courteous and knowledgeable. They don't rush you and take the time to explain the process, application etc. Very happy with their services.